The Board of Supervisors for the University of Louisiana System held its regular Board meeting at the Davison Athletics Complex on the campus of Louisiana Tech. In addition to the Board meeting, members visited Grambling State University and the University of Louisiana at Monroe. Educating Louisiana is the UL System’s new campaign to tout the effect the System and the impact System graduates are having on the state. A landing page featuring alumni profiles can be found at www.ULSystem.edu/EducatingLA. The campaign, in its infancy with plans to grow, will be shared online, on social media and through e-blasts. 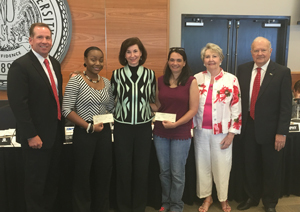 Dr. Sally Clausen presented four UL System students in teacher education programs the Tom and Kyle Clausen scholarship. The scholarship, established by the University of Louisiana System Foundation using financial contributions from the Clausen family, funds professional development for future educators. Recipients are Kristi Martin, a senior and first-generation college student studying elementary education at Nicholls State University; Ginger Abney, a senior and aspiring kindergarten teacher studying early childhood development at Grambling State University; Raquel Boudreaux, a senior studying Integrated to Merged Elementary Education at the University of New Orleans; and Ann Rudesill, a mother of four and freshman at Southeastern Louisiana University studying early childhood education. 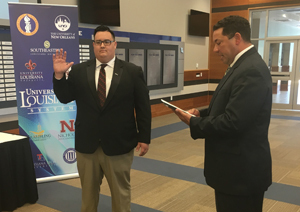 UNO Student Government Association President Antonio Torres was sworn in as the student board member of the Board of Supervisors for the University of Louisiana System. LA Tech: approval of a Proposal for a Graduate Certificate in Rehabilitation Teaching for the Blind. LA Tech: approval of a Proposal for a Graduate Certificate in Orientation and Mobility. McNeese: approval of four Post Baccalaureate Certificates for the Practitioner Teacher Program. Northwestern: approval of a Proposal for a Bachelor of Science in Applied Microbiology. ULM: approval of a Proposal for a Post Baccalaureate Certificate in Accounting Technology. UNO: approval to merge the Departments of English and Foreign Languages. UNO: approval of a Memorandum of Understanding between the University and Corporación Universidad de la Costa-CUC, Barranquilla, Colombia. UNO: approval of a Memorandum of Understanding between the University and Universidad Panamericana, Campus Guadalajara, Mexico. La Tech: approval of a revised Athletic Complimentary Ticket Policy. McNeese: approval of a contract with Ms. Helena Besovic, Head Women’s Tennis Coach, effective July 1, 2016. McNeese: approval of a contract with Mr. Andrew A. Burk, Jr., Head Men’s Golf Coach, effective July 1, 2016. McNeese: approval of a contract with Ms. Kacie J. Cryer, Head Women’s Basketball Coach, effective April 13, 2016. McNeese: approval of a contract with Mr. Andrew O. Fitzgerald, Head Women’s Soccer Coach, effective July 1, 2016. McNeese: approval of a contract with Ms. Ashleigh M. Fitzgerald, Head Women’s Volleyball Coach, effective July 1, 2016. McNeese: approval of a contract with Mr. Michael E. Fluty, Head Women’s Golf Coach, effective July 1, 2016. McNeese: approval of a contract with Mr. Brendon James Gilroy, Head Men’s/Women’s Track Coach, effective July 1, 2016. McNeese: approval of a contract with Mr. Justin W. Hill, Head Baseball Coach, effective July 1, 2016. Nicholls: approval of a contract with Mr. Richie Riley, Head Men’s Basketball Coach, effective May 2, 2016. Northwestern: approval of a contract with Mr. Jordan Dupuy, Head Women’s Basketball Coach, effective May 16, 2016. Southeastern: approval of a contract with Mr. Errol Gauff, Head Women’s Basketball Coach, effective June 1, 2016. LA Tech: approval to adopt a Second Supplemental Bond Resolution in connection with the University’s outstanding $3,975,000 Revenue Refunding Bonds, Series 2012. LA Tech: approval to lease space in Tech Pointe to Radiance Technologies, Inc.
Nicholls: approval to name the football press box in the John L. Guidry Stadium The C.C. Collins Press Box. Nicholls: approval to demolish the Ticket Booth located at the Ray E. Didier Field Baseball Complex. Nicholls: approval to demolish the Barn and Milk Parlor located at the Lafourche Crossing Farm. Southeastern: approval of the execution of leases with University Facilities, Inc. in connection with the development, construction, renovation, demolition, and equipping of replacement student housing facilities on the campus of the University and the refinancing of outstanding debt related to existing parking facilities. Southeastern: approval of a Memorandum of Understanding with Northshore Technical Community College for Sharing Faculty/Staff Development Opportunities. Southeastern: approval to change guidelines for the following Professorships in the College of Business: Dorcas and H.N., Jr. Capron in Marketing; Dorcas and H.N., Jr. Capron in Supply Chain Management; Joyce C. Junghans in Accounting; Joyce C. Junghans in Finance; Joyce C. Junghans in Management; and Parish National Bank in Accounting. UL Lafayette: approval to split the South Louisiana Mid-Winter Fair/BORSF Professorship in Applied Life Science into two Professorships and also to rename these to: (a) South Louisiana Mid-Winter Fair/BORSF Professorship in Environmental Science I and (b) South Louisiana Mid-Winter Fair/BORSF Professorship in Environmental Science II. ULM: approval of an Interagency Agreement with the Ouachita Parish Police Jury to operate the Center for Clean Water Education and Technology as an environmental research and education facility on property owned by the Ouachita Parish Police Jury near Calhoun, Louisiana. ULM: approval of a Cooperative Endeavor Agreement with the City of Monroe to use the closed Selman Field golf facility. UNO: approval to convert the Jerome L. Goldman Chair in Naval Architecture and Marine Engineering into three Endowed Professorships: Jerome L. Goldman Endowed Professorship in Naval Architecture and Marine Engineering I; Jerome L. Goldman Endowed Professorship in Naval Architecture and Marine Engineering II; and Jerome L. Goldman Endowed Professorship in Naval Architecture and Marine Engineering III. UL System: approval to authorize a Taylor Opportunity Programs for Students (TOPS) fee exemption for FY 2016 to address the Spring 2016 (TOPS) shortfall. UL System: approval to authorize the System President and a special Board committee to approve fees pursuant to House Bill 152 of the 2015 Regular Session of the Louisiana Legislature and GRAD Act Tuition Increases. UL System: approval of System Universities’ Fiscal Year 2016-17 Internal Audit Plans. Grambling: approval to continue the appointment of Dr. Janet Guyden as Interim Provost and Vice President for Academic Affairs effective July 1, 2016. Grambling: approval to continue the appointment of Mr. Otto Meyers as Interim Vice President for Research, Advancement, and Economic Development effective July 1, 2016. Grambling: approval to continue the appointment of Dr. David Ponton as Interim Vice President for Student Affairs effective July 1, 2016. Grambling: approval to continue the appointment of Dr. Erick Valentine as Interim Dean of the College of Business effective July 1, 2016.